It’s no secret that Japan is the country of vending machines (they even have models like this one now), but this is new: Tokyo-based beverage company Asahi Soft Drinks took the wraps off a vending machine [JP] that not only offers drinks but also sends out Wi-Fi signals within a 50m radius. The Wi-Fi will be available for free, is accessible with multiple devices, without registration, and for anyone to use (meaning users won’t have to buy any drinks to go online through the machine). It’s possible to use the web for about 30 minutes before the machine cuts you off (re-connecting is possible, however). After logging in, users will see various location-specific information on the home screen, for example on local stores, or sightseeing spots. 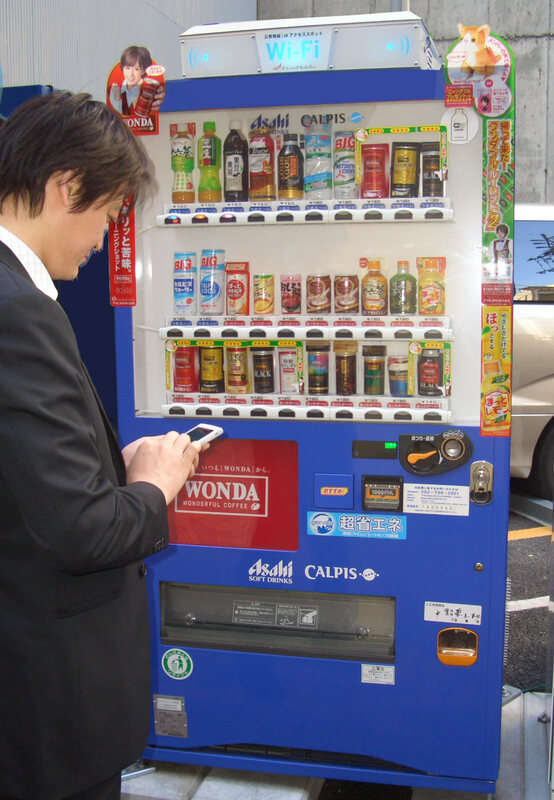 Starting in 2012, Asahi will set up 1,000 of the vending machines in five different regions in Japan (Tokyo, Sendai, Chubu, Kinki, and Fukuoka) in the first year. The plan is to roll out a total of 10,000 units in the next five years. Asahi is currently operating 250,000 vending machines all over Japan.